Vinyl Acetate Monomer « Global Market Insights, Inc. The global acetic acid market is witnessing a major upswing with the growing utilization trend of this acid as a raw material to produce purified terephthalic acid (PTA) and vinyl acetate monomer (VAM). Acetic acid is used as an intermediate in formulating polyester, coatings, greases, and sealants which are widely used in textiles, automotive, packaging, paints & coatings, and electronic industries. The overall acetic acid market is certain to generate lucrative avenues, owing to its rising application scope in aforementioned industries. A report on Acetic Acid Market predicts the industry to register an annual growth rate of 8.7% over 2017-2024 and generate revenue over USD 16 billion by 2024. The expansion of the global chemical industry has almost doubled in terms of value over the last decade and was recorded around USD 5 trillion in 2013. This has strongly influenced the growth of acetic acid market as this acid finds its major application in the production of purified terephthalic acid, acetate esters, vinyl acetate monomer, and acetic anhydride. In terms of volume purified terephthalic acid contributed to more than 25% of the global acetic acid industry share in 2016. PTA is further used in the production of polyester films, polyester fiber, and polyethylene terephthalate (PET) resin. Vinyl acetate monomer is another major application segment which finds wide application in making of polymers and resins used in paints, films, adhesives, and textiles. North America, led by US acetic acid industry, recorded a consumption of over 1900 kilotons in 2016. The pharmaceutical industry holds a strong foot in North America with the presence of major manufacturers such as Johnson & Johnson, Novartis, Roche Holding AG, and Gilead Sciences. This factor has led to increasing demand for medical devices and saline bottles which are made from polyethylene terephthalate (PET. 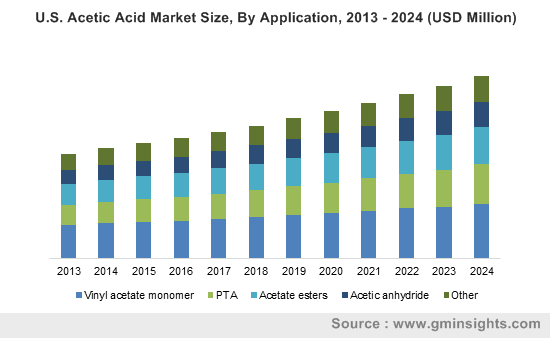 The regional acetic acid market will witness a profitable growth over the years ahead, owing to its profound usage as raw material in the production of PTA. Acetic acid industry is quite consolidated and is likely to witness an increasingly growing trend of mergers and acquisitions. In 2011, the acetic acid product division of Sterling Chemicals was acquired by Eastman in order to support its growth strategy for the plasticizers and acetic acid product-line. The manufacturers are aggressively involved in research and development activities to develop bio-based pathways for the complete replacement of fossil based raw materials. Bio-based acetic acid can be manufactured from fermenting sugar, ethanol, and corn starch. The product synthesis with bio-base material is gaining a wide acceptance among the consumers. Wacker Chemie, a well-known chemical company has recently established its bio-based acetic acid plant in Germany having an annual capacity of 500 tons. Bio-based acetic acid on grounds of addressing the hazardous environmental effects is poised to bring a paradigm shift in the global acetic acid industry landscape. Some of the major participants in this space include Saudi International Petrochemicals, DuPont, Celanese Corporation, Mitsubishi Chemical Holdings Corporation, Jiangsu Sopo (Group) Co., Ltd., Sinopec, Wacker Chemie, and British Petroleum (BP). This entry was posted in BIOMASS, BIOENERGY AND RENEWABLE CHEMISTRY and tagged Acetate Esters, Acetic Acid, Acetic Acid Consumption Market, Acetic Acid Demand, Acetic Acid Market, Acetic Acid Market Outlook, Acetic Acid Market Report, Acetic Acid Market Size, Acetic Acid Production, Acetic Anhydride, Bio-based Acetic Acid, Global Acetic Acid Market, Purified Terephthalic Acid, Vinyl Acetate Monomer.